Washington D.C. might seem an imposing place for families, and particularly those with young children. The center of American political life and host to some of history’s most famous events, one could argue that visitors need some knowledge of our political past to truly appreciate it. How completely false! The youngest of children—or any not yet privy to American History 101—can find a world of educational and cultural wonders within the city’s confines. Here’s what to explore in Washington D.C. with kids. The city itself is remarkably friendly to families and tourists, particularly with regards to its layout and use of physical space. Sidewalks are enormously wide, there’s room for bikers and strollers to zigzag simultaneously, and children prone to hyperactivity have ample room to run amok before winding up in the busy street. In the main area of D.C., all roads lead to museums, so long as one is willing to walk moderate distances. Although some of the museums have no direct link to Washington D.C.’s storied evolution, some are living meditations on the city’s hidden and public existence. The International Spy Museum initially, what with its focus on Cold War espionage, was perhaps less than an ideal museum choice for my young toddler. However, for slightly older children—and for me, to a profound degree—this unique Washington D.C. museum offers a cornucopia of mysterious delights.The museum opened just 13 years ago, and its content reflects the modern perspective of its Board of Directors; James Woolsey (former Director of Central Intelligence), Judge William Webster (Chair of the Homeland Security Advisory Council), and a host of experts on counterintelligence and cryptology all serve as advisors for the museum. 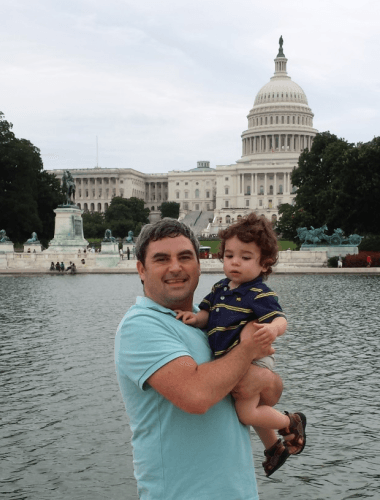 During my visit to Washington D.C. as part of a father-son travel blogger trip courtesy of Hilton Garden Inn, I spoke to several dads and kids who were largely in awe of the museum’s James Bond-esque displays. We saw lipstick pistols, umbrellas that shoot poison darts, and microphones hidden in books and packs of cigarettes. It’s not just a cerebral zone where adults can scratch their chins and read placards either. The museum houses interactive activities that children over the age of 5 will happily engage in. There is some emphasis on popular culture villains and spies that kids will know. As a word of caution, the museum can get pretty crowded, and some small galleries make for a stop-and-go experience at times. Strollers aren’t allowed in the galleries, so be prepared to carry any babies or toddlers you typically push. The National Museum of the American Indian is a dynamic and progressive institution, and it makes every effort to court families. 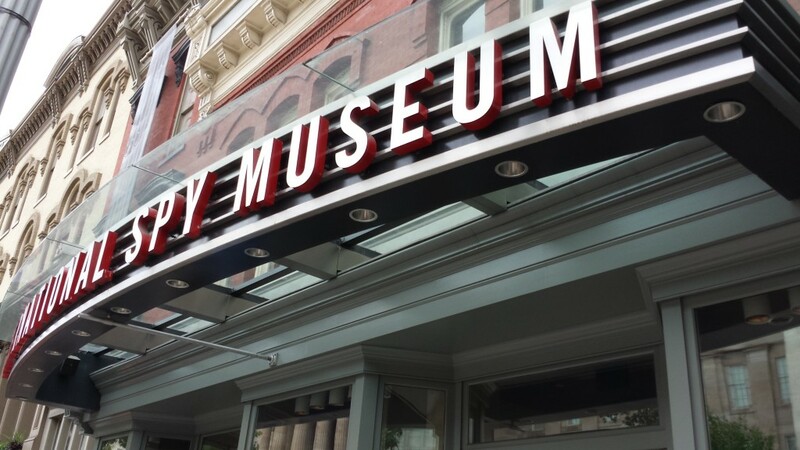 The museum offers visiting families an appropriately named Family Guide, which directs them towards seven activities that are especially kid-friendly. My toddler relished the open spaces on the upper floors. 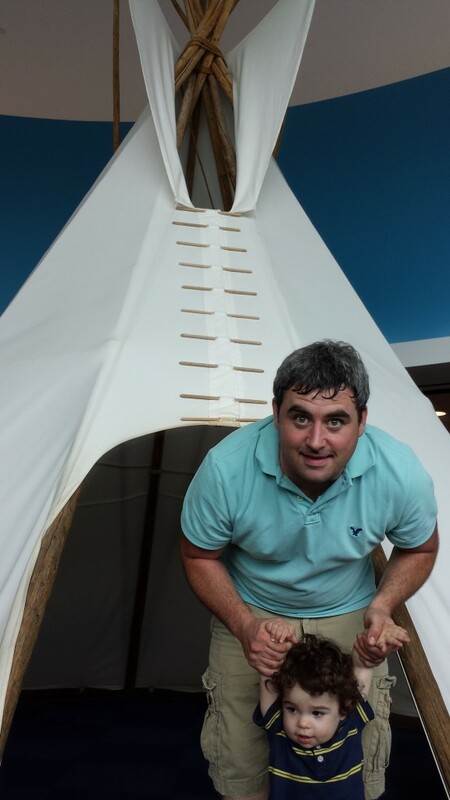 Here kids are encouraged to play boisterously around and within a sizeable tee-pee, try on outfits made from animal hides, and learn about star constellation legends under colorful canopies. It’s all part of the museum’s broader imagiNATIONS Activity Center, where kids can weave baskets, wear snowshoes, and make music in the Native Beats Music Room. Upon arrival, my family was seduced by the lure of the museum’s cafe, which my food critic sister insisted was world class. Misitam Cafe was expensive, but offered a myriad of foods from various corners of the globe, most of which tasted quite delicious. Since so many museum restaurants only serve vaguely labeled sandwiches wrapped in plastic, it was a nice change of pace. A staggeringly large edifice, the Smithsonian Institution National Museum of Natural History contains over 1.5 million square feet of space. Although it opened 103 years ago, the museum is extremely new and cutting edge. The dioramas hanging from a towering ceiling and perched upon sloping precipices are almost frightening in their grandeur. Adventures here will appeal to every imaginable age group. 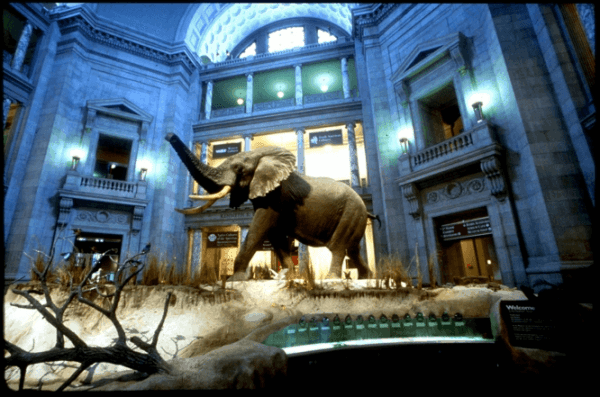 The NMNH boasts over 126 million items in its collection, which encompasses everything from the Hope Diamond to Tyrannosaurus-Rex bones and 35 million samples of invertebrates. During our visit the crowds were massive, steady, and without organized direction. Still, the place is friendly to strollers and families, with large enough space that one can always find an empty gallery corner allowing for observation of the museum’s collection. It simply dwarfs other renowned natural history museums, and it’d be hard to find a child not intrigued by some aspects of its collections. It’s a place where days could be spent without redundancy. During this recent trip, my family took in the most famous sites while in Washington D.C., including the White House, the Capitol Building, the Jefferson Memorial, the Lincoln Memorial, the Vietnam Memorial, and the Washington Monument. Perhaps unsurprisingly, none of those famous structures inspired the awe generated by the city’s great museums. For older children, recognizing the historical importance of the spots can clarify their understanding of United States history. In terms of fun, however, the most famous attractions may be a bit too hands-off to justify lengthy visits. As the home to America’s federal political activity, Washington D.C. has become defined by its famous buildings and memorials. It’s thus become regarded as a strictly educational place, where families should go out of necessity without expectation of fun. As with most things, preconceived notions can be smashed by experience, and young children bored to the core by inanimate statues will find respite in the city’s museums and cultural splendor. 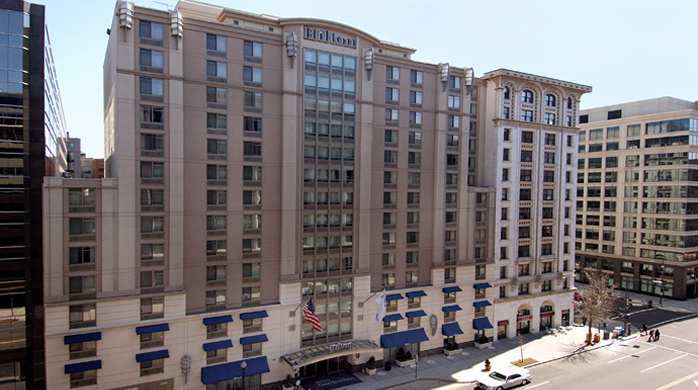 My family stayed at the Hilton Garden Inn Washington D.C. Downtown. Its close proximity to D.C.’s downtown attractions and museums was a major bonus. The hotel’s rooms were practical and spacious, equipped with the functional amenities a traveling family would require like free a 24-hour pantry for snacks, WiFi, and hot breakfast served on-site. To boot, the hotel staff was remarkably accommodating, with the restaurant’s workers always smiling and providing prompt service. With the Hilton Garden Inn’s affordable price tag, this hotel makes a sensible and comfortable choice for traveling families. Check back soon for my full review of this hotel! 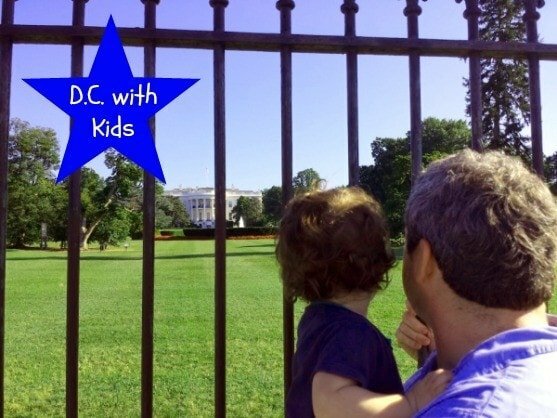 What do you think is the best age to bring a child to Washington D.C.? Let us know in the comments below! All photos by Gabe Miller except where noted otherwise. This article is fantastic. I haven’t been to DC for over 15 years and from reading this review I see that it’s time to go again. I was trying to picture where we would stay and the Hilton Garden Inn sounds like the perfect place. Glad you enjoyed it Ellen. And yes, the HGI’s location is really prime. Get ye back to D.C! Hey Gabe! I know this was posted a while ago but I still want your opinion. I used to be an avid traveler to D.C. going at the very least every two years to explore the exhibits and the museums. I feel like there is never enough time each time I go! Well, now I am a single mother of an only child and we have been visiting Disney World or other family family places in place of what I used to do. Don’t get me wrong, I love Disney but I want to know a little more about your experience. Were you ever frustrated that you had to shorten your time spent looking at exhibits? Was it difficult keeping your son away from “No Hands” exhibits? How much was offered for your child in terms of age appropriate places to explore, touch, and play? I really wanna go back and I’m just not sure if she is still to young (about to turn two). Thank you for this article! Hi Brittany – Gabe no longer writes for Travel Mamas. Personally, I think nearly any destination is do-able with children when you choose kid-friendly attractions and make plenty of time for play and naps. Having said that, I am waiting to bring my kids to Washington DC when they are a bit older. I’m thinking age 14 and 11 will be ideal ages for them to understand the significance of the museums and monuments. If, however, I lived closer I would have no qualms about visiting with little kids. Have a wonderful time in DC!